On behalf of the Board of Directors, I wanted to be one of the first to congratulate you on making Stand-Your-Ground law a reality here in Iowa! Stand-Your-Ground law (House File 517) officially takes effect today! None of this would have happened without your nonstop work! All of your calls, all of your emails, and all of your financial contributions combined to make this issue one of the hottest in Iowa politics in 2017! >>> Removal of the ridiculous law that makes it a crime for parents and grandparents to decide when to teach their children to shoot a pistol. >>> Emergency powers legislation that would remove the Governor’s ability to ‘suspend’ your gun rights during a natural disaster. >>> Pre-Emption reform language that would prohibit cities and counties from enacting their own gun ban, something that is a hot topic right now. >>> Permit confidentiality language that would protect a gun owners’ right to privacy. >>> Language that removes the ban on carrying a handgun in the Iowa Capitol for anyone who has a permit. >>> Streamlining the permit and renewal process. >>> Provisions to allow for Short Barreled Rifles (SBR’s) in accordance with federal law. So as you kick off your 4th of July holiday weekend in celebration of our forefathers who secured our nation’s independence, take a moment to congratulate yourself for continuing their fight for freedom. And after you enjoy this time, commit yourself to redoubling your efforts next year as we lead the charge for Constitutional Carry! As you’ll remember, this legislation did not just happen on its own. In fact, many said ‘Stand Your Ground law will never happen here’ as you can see from this news report from a couple of years ago. Anti-gun legislators in both chambers opposed us. Bloomberg funded front–groups opposed us. And weak-kneed House leadership, under the control of Matt Windschitl, almost did gun grabbers a favor by gutting the criminal immunity language in the 11th hour! But you refused to give up. More importantly, you have refused to give up for a very long time, which is why three dozen failed political careers have lined the gutter of Iowa history as we made our way to the finish line in this fight. So this is your victory! P.S. 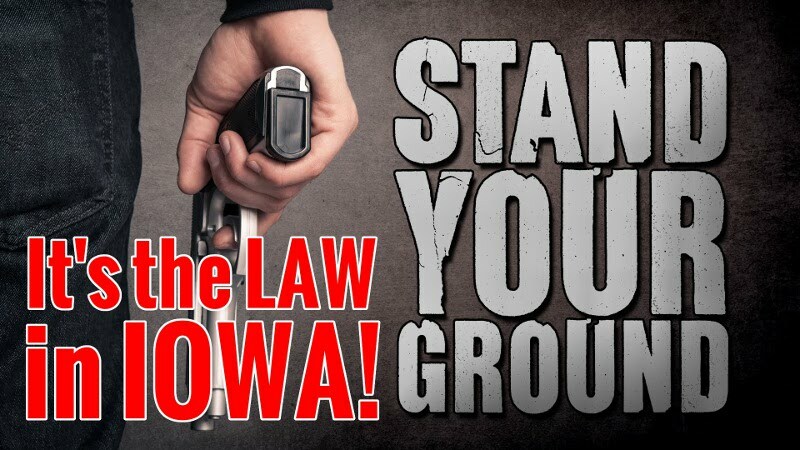 As of today, Stand-Your-Ground law and so much more takes effect here in Iowa! For years the legislature, the liberal news media, and Bloomberg-funded organizations opposed us and blocked this bill. But you never gave up, as three dozen anti-gun incumbents, whom you removed from office over the last couple of years, can attest to! So as you celebrate our forefathers who gave our nation her independence, take a moment to celebrate your own activism that is helping to ensure freedom for the next generation! And then recommit yourself to the fight for the Second Amendment here in Iowa as we lead the charge for Constitutional Carry next year!